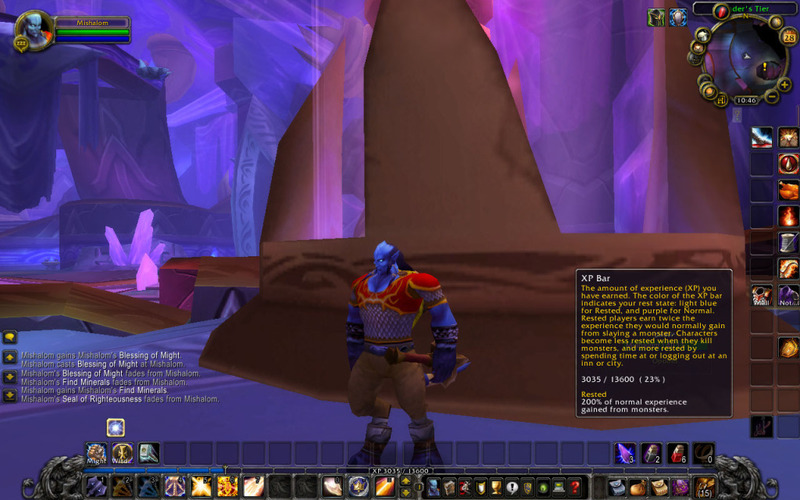 As mentioned in the introductory post about the Pally of the Pugs (a project inspired by the Pugging Pally Vidyala), I said we would get to meet him next time. Well, here he is. While I haven’t given too many details to his character, I think I have enough to BS my way through a meet form. So let’s do that before we go into the PoP Project Details! Appearance: Please see the above picture. 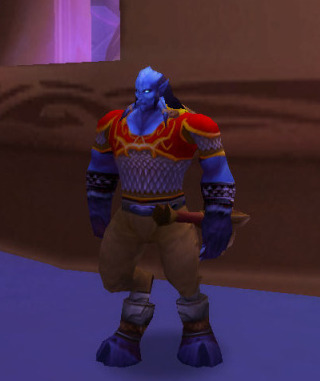 Pretty typical of Draenei men — strong, tall, and buff. History: Mishalom has been a soldier of the Light for a long time; the majority of his life, in fact. At one point he had a wife, but that marriage ended on good terms when… well, when he knew he was not interested in women. ((And to all of you thinking “omg it’s so cliche for a girl to make a guy character gay!”… yes, it is (well, at least my experiences reading fanfiction has indicated that it is. Since most fanfic writers are girls. >.>). But I believe I’m entitled one. 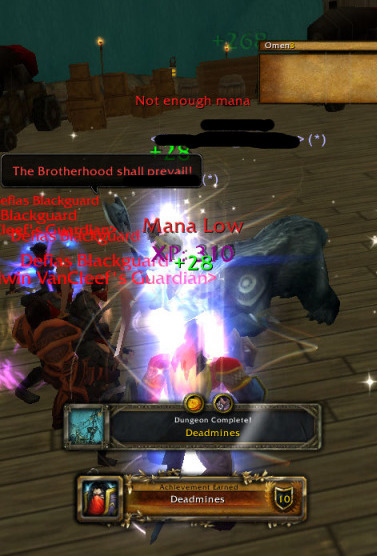 And it’s not the Blood Elf so I think this is charting new territory (Ooo, burn!))). This ‘discovery’ caused some … strife, but as the (hundreds of) years went by, things more or less smoothed over (perhaps a little less than more). 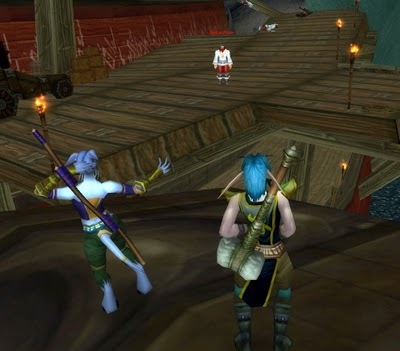 When the Draenei came to Azeroth, he embraced their new allies whole-heartedly. He now splits his time between all of the Alliance capital cities (though he spends more time in Stormwind than the other cities), studying nuances of the Light, and lending his aid to others in the Alliance. Personality: He is a good-natured fellow, very devout to the Light, eloquent with his words, and tries to be helpful. He usually doesn’t speak up too much, preferring to stay in the background. But if you’re interested, he’ll happily spout off tenets of the Light at you all day. But don’t think that he’s weak just because he only ‘heals with the Light’ — he’s taken down unskilled folks who’ve challenged him before! 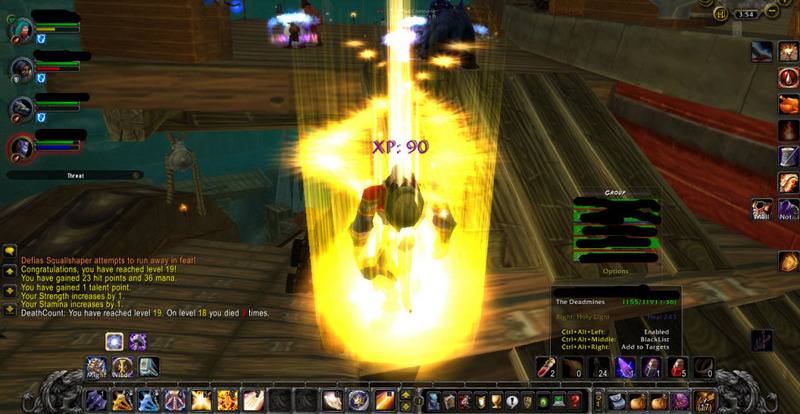 (This is why you should never underestimate a Paladin — they wear plate armor for a reason!). He’s pretty much a quintessential nice tough guy. 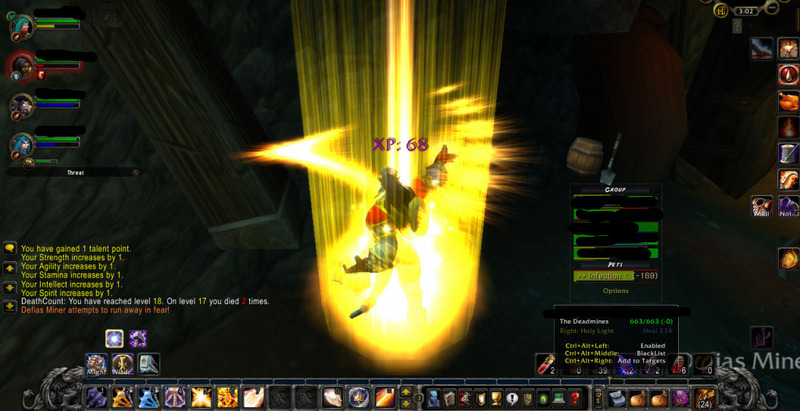 Yes, it’s true; I made one of my only guy character gay (maybe the real shocker is that it wasn’t the Blood Elf). But the majority of his storyline that revolved around his sexuality has already played out much earlier in his life. Like… hundreds of years earlier. He doesn’t go around announcing that he’s gay, he doesn’t act ‘stereotypically gay’, so to most people he’s just another Light-obsessed paladin (which makes sense, because he is a Light-obsessed paladin. I would think that most paladins are). Mishalom is also a fairly stable character. He doesn’t have much personal growth to do at this time, as much of it has already been done. This is because I’m not sure if or when I will be RPing with him in-game — I think it’s good to leave him at a steady point in his life. If I do get the opportunity to RP with him, especially in a long-term group setting, it will be interesting to see how his relationships with others will affect his relatively quiet personality… especially when the others figure out that he’s gay, since he wouldn’t go announcing it to them. Either way, the possible character interactions seem very interesting, even if I won’t get a chance to RP them. As for Mishalom’s name… I’m trying to keep all of the Argent Dawn characters starting with ‘Misha’, so people still shorten my name(s) to Mish or Misha. But it was tricky to come up with a ‘manly-sounding’ name starting with Misha (since to me, Misha sounds like a girl’s name) that wasn’t already taken. After some brainstorming by myself and with people from SAN (and The SA, actually), I finally decided on Mishalom. Why? Because ‘Shalom’ is the Hebrew word that means ‘Peace’, and this character that I was envisioning (which you can now see above) was a very peaceful kind of guy. Plus, it ends with an ‘m’ which is not as ‘girly’ as ‘a’. (I have a tendency to add ‘a’ to the end of my female characters’ names to make them sound more girl-like. I’m trying to stop doing that on purpose, though). But enough about his roughly-flushed out RP character side. Let’s shift focus to what I’ll be talking about the most when it comes to Mishalom — the “Pally of the Pugs” project. Well, I supposed there’s not too much solid proof… but I did take lots of screenshots of his stats before I first queued up! Let’s take a look-see at what I got! (Feel free to click the screenshots to embiggen). 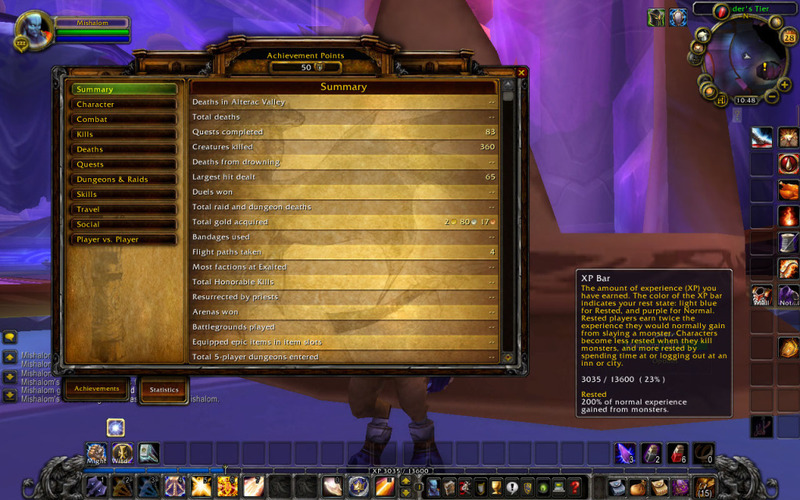 Here’s Mishalom’s XP bar right before I went to queue. If you’ll ignore my crappy UI, you can see that he’s already part of the way through 15 (ok, you can’t see his level, but I assure you that’s level 15!) This is because paladins have their quest to learn how to rez people starting at 15. 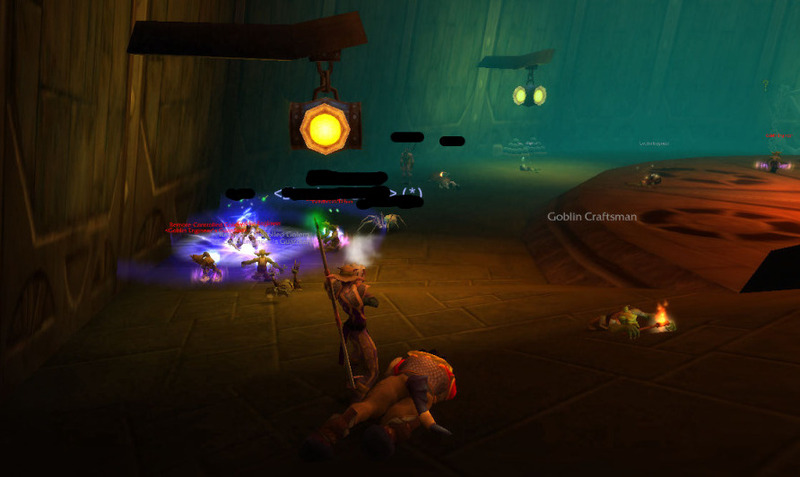 I thought it would be good to know how to rez people before I started going into dungeons, so I went ahead and did the quest. And below are three additional screenshots I look of Mishalom’s various statistics and achievements (or lack thereof), from the stat/achievement page. You may, of course, click any and all of these to embiggen. The Stats Summary shows that I hadn’t died yet. Good for past me! Sadly, it was too good to last. Maybe we can keep the ‘Death from Drowning’ Category clear. That seems like a reasonable goal. It also shows that at this point I had completed 83 quests. I hope to keep it at that number — or at least be aware when I do complete a quest! 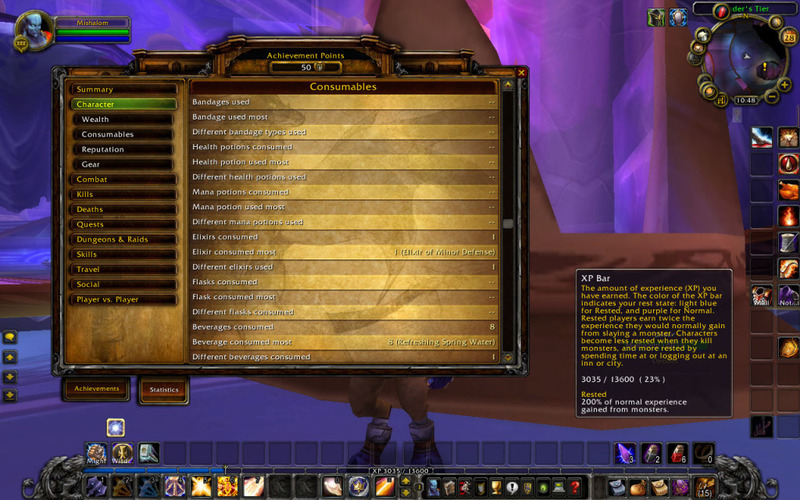 The Consumables Page shows I hadn’t really consumed much. Just an Elixir of Minor Defense and 8 Refreshing Spring Waters. Since I plan on recording the number of drinks consumed, it’ll be good to note that I had already had 8. The Achievements Page, besides being cropped to hide the fact that I took the screenshot with all my bags open for some reason, shows that Mishalom was indeed a fairly young character. 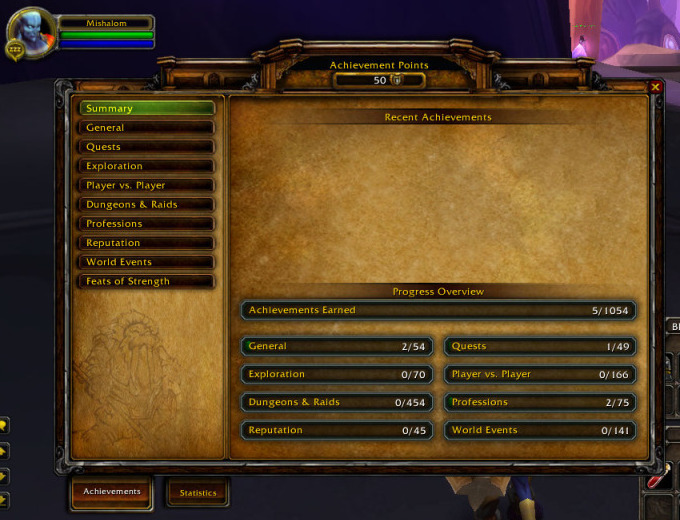 No recent achievements, for one, because even I take forever to level a character to level 15, apparently. And only 5 achievements to his name, total! You can see the breakdown on the screenshot, even though I didn’t take screenshots of each one. I’m going to guess they’re fairly standard ones for baby characters to get (like Level 10, for instance). But What Stats Will Be Recorded? Drinks Consumed: 132 (+12) // Total number of drinks consumed, along with the differential. Dungeons Run: 2 (+2) // Total number of dungeons run, plus the differential. This is calculated by me unless otherwise stated. –RFC: 5 // An individual dungeon’s total. This is calculated by me entirely, not by blizzard stats. Once a run is out of my level range, I will stop putting the differential in.